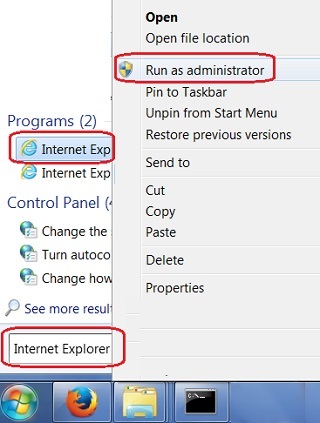 How to start IE as an administrator? Do I need the administrator permission to delete a root CA certificate? 1. Close all IE windows. 2. Type "Internet Explorer" in the Start search box You see list of suggestions. 3. Right-mouse click on "Internet Explorer" in the suggestion list. You see the context menu. 4. Click "Run as administrator" on the context menu. You see IE (Internet Explorer) started. 5. Now you should be able to use the "Remove" on Certificate Manager to delete a root CA certificate.